Health-seeking behavior has been defined as the activity undertaken by individuals who perceive themselves to have a health problem or to be ill for the purpose of finding an appropriate remedy. It also refers to the decision-making for health care at the household level wherein the decision made encompasses all the available options; public and private, modern, and traditional. In its broadest sense, health-seeking behavior includes all behaviors associated with establishing and maintaining a healthy physical and mental state (primary prevention), behaviors that deal with any digression from the healthy state (secondary prevention), and reducing impact and progression of an illness (tertiary prevention). What people do when they have symptoms of illness may have major implications on progression of the illness and possible outcome of the disease. Delays or refusal to seek and obtain proper diagnosis and treatment can lead to adverse sequelae. Data have been gathered on self-care, visits to traditional healers, and unofficial medical channels; these are, however, often seen as practices which should be avoided with the emphasis on encouraging people to opt for the official channels. There exist some forms of variation in the pattern of health-seeking behavior among health workers across the world. In a study carried out in the United Kingdom, about 61% of nurses did not seek medical attention, despite having back pain; also in Sao Paulo, Brazil, only about 6% of health workers had ever gone for screening for colorectal cancer. In Israel, 67% of family physicians do not have a regular physician for themselves, and up to 72% of them often embark on self-medication. Also in a study in South Africa, 71.5% of doctors often treated themselves and their families, and about 14.5% had never gone for medical checkup. In Ilorin, Nigeria, a study has shown that the practice of periodic health checkup among hospital workers was poor as only a fifth of them ever had periodic checkups, and even among those who did, it was irregular and often after long intervals. Instances have been reported whereby people who are generally believed to be in a state of optimal health have suddenly collapsed and died as a result of previously existing undetected health problems. This could have been due to a medical condition that would have been detected and managed early if routine medical checkup had been embarked upon. It is a common practice to see health workers treating themselves or avoiding seeking for health care and this is a big problem because misdiagnosis and habituation can result from such acts. It has been reported that personal health habits of physicians are major predictors of their counseling practice. This study therefore, set out to assess the factors influencing health-seeking practices of health workers, with a view to provide the basis for possible intervention or policy formulations by hospital management to ensure that health workers possess the right attitude and practice toward seeking for health care. The study was conducted in Usmanu Danfodiyo University Teaching Hospital (UDUTH), located within Sokoto metropolis in Sokoto State, Northwest Nigeria. The hospital, with staff strength of over 1700, provides facilities for diagnostic, curative, preventive, and rehabilitative health services. It also serves as a referral center to a number of hospitals within and outside Sokoto State. The study population comprised all doctors, nurses, and laboratory scientists in UDUTH, Sokoto. Only those who have been employed for at least 6 months in the hospital were considered eligible for the study. Doctors and medical laboratory scientists (MLS) on internship were excluded from the study. It was a cross-sectional descriptive study conducted between April and August 2015. The sample size was calculated using the formula for descriptive studies in a population <10,000; nf = n/1 + n/N. The value for “n” was calculated using the following formula: n = z2pq/d2, which was later substituted into the initial formula (nf = n/1 + n/N) to get the sample size. Using 12.6% prevalence of periodic medical checkup as reported in a previous study, a sample size of 144 was obtained. A response rate of 90% was anticipated, thus the sample size was adjusted to 160. Stage 2: From each of the selected departments and laboratories, participants were stratified according to their ranks, followed by proportionate allocation. From each stratum, a proportionate number of participants were selected using simple random sampling technique (by ballot method). A semi-structured questionnaire was used. The questionnaire consisted of four sections with 52 stem questions. Section A contained questions seeking respondents' sociodemographic characteristics. 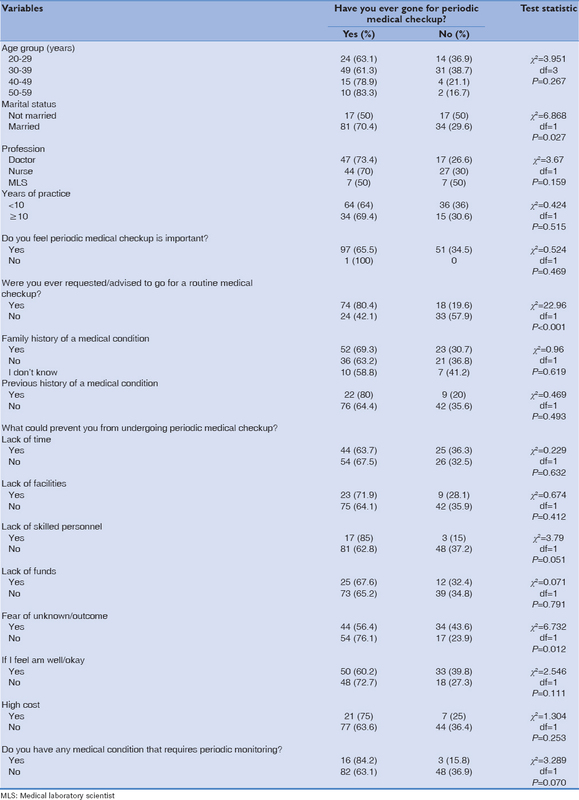 Section B contained questions on respondents' perception regarding periodic medical checkups and self-medication. Section C explored the pattern of voluntary medical checkups and self-medication of health workers while section D contained questions regarding factors influencing health-seeking behavior of health workers. Data were collected through interview using the above-mentioned instrument. Four medical students, who were trained on how to administer the questionnaires, conducted the interview. A pilot survey was conducted among health workers (doctors, nurses, and laboratory scientists) in a secondary health facility within Sokoto metropolis. This was followed by a slight modification of the research instrument. The data were analyzed using IBM Corp. Released 2011. IBM SPSS Statistics for Windows, Version 20.0. Armonk, NY: IBM Corp. and Microsoft Excel 2010. Mean and standard deviation were calculated for continuous variables while categorical variables were analyzed and expressed in frequencies and percentages. Difference between proportions was determined using the Chi-square test. Level of statistical significance was set at 5% (P < 0.05). Ethical clearance was obtained from the Research and Ethics Committee of UDUTH on 23rd January 2017. In addition, written informed consent was obtained from the participants after explaining the purpose of the study. All information obtained was handled with utmost confidentiality. Of the 160 participants selected for the study, 149 completed the questionnaires, thus giving a response rate of 93.1%. Their mean age was 34.57 ± 7.172 years, with more than half of them, i.e. 80 (53.7%) within the 30–39 years' age group. Males were slightly more represented, i.e. 81 (54.4%) than females (68 [45.6%]). Seventy-four (39.7%) of them were Hausa, 18 (12.1%) were Igbo, 29 (18.8%) were Yoruba, and up to 67.1% were Muslims. Up to 67.1% of the respondents have been in service for <10 years. Out of the 64 doctors interviewed, 15 (23.4%) were consultants, 22 (34.4%) were senior registrars, and 27 (44.2%) were registrars/medical officers. About 10% of the nurses (n = 7) were chief nursing officers and 40.3% (n = 29) were nursing officers II. Among the laboratory scientists, more than half of them, i.e. 7 (53.8%) were MLS I [Table 1]. With regard to their perception, almost all the respondents (99.3%) felt that periodic medical checkup was important. Nearly 53% felt that periodic medical checkup should be performed every 6 months while 30.2% felt it should be performed yearly. Most of the respondents (79.9%) felt that periodic medical checkup should be made mandatory for all health workers and 75.8% believed that hospital management should be responsible for the financial cost of these checkups. 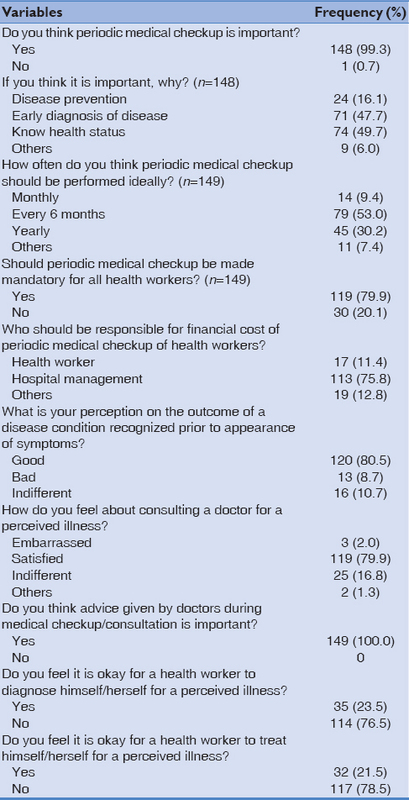 When respondents were asked on how they felt about consulting a doctor for a perceived illness, 79.9% felt comfortable and 2.0% felt embarrassed; all the respondents believed that the advice given by doctors during medical checkup was important [Table 2]. Regarding their reasons for not going for periodic medical checkups, 55.7% of the respondents said that they felt they were well and so did not need to undergo periodic medical checkup. 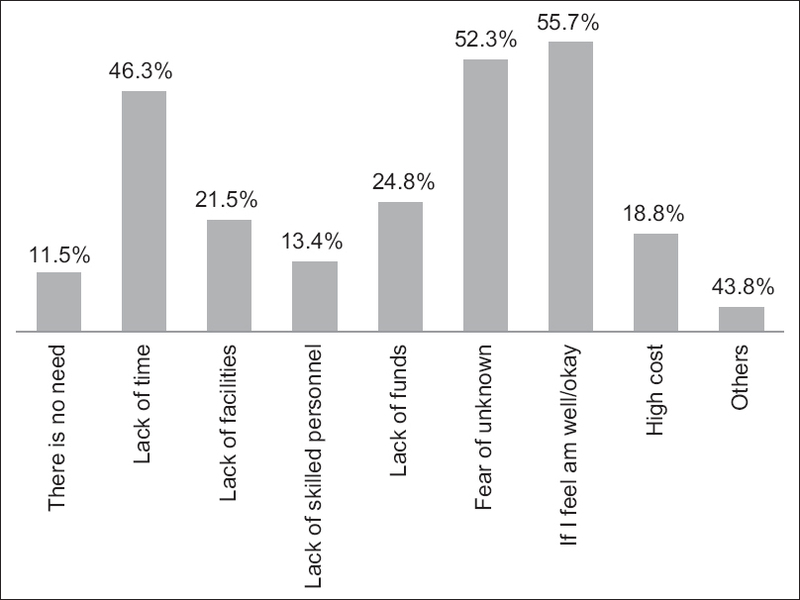 About 52% of them felt that fear of the unknown prevented them from undergoing periodic medical checkups [Figure 1]. 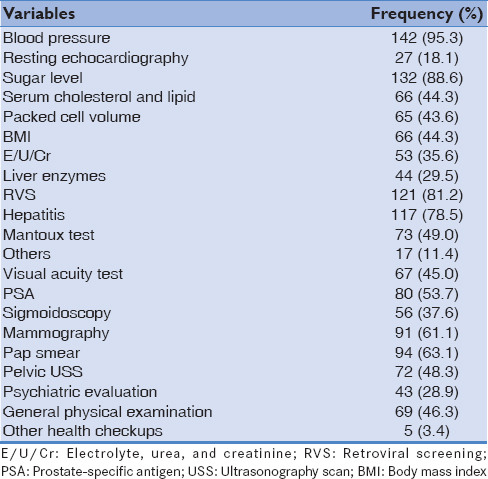 Most of the respondents (95.3%) considered blood pressure measurement to be important and should be performed regularly; other screening tests considered important were estimation of blood sugar level (88.6%), retroviral screening (81.2%), screening for hepatitis (78.5%), as well as mammography (61.1%) and Pap smear More Details (63.1%) [Table 3]. Regarding the practice of voluntary medical checkup, 65.8% had gone for checkup at least once, out of which 31.6% had gone for such medical checkup within the past 6 months. Among those who had been advised to go for periodic medical checkups, 43.9% were advised by a doctor and 31.6% by colleagues from their profession. 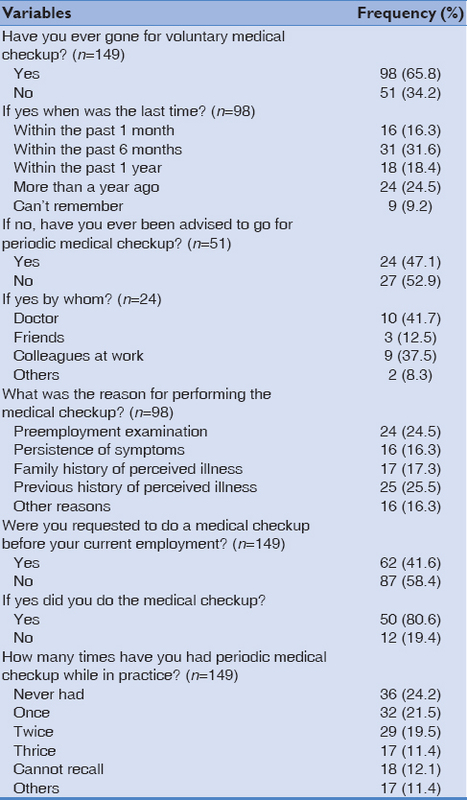 The reasons for performing medical checkup were previous history of perceived illness among 25.5% of the respondents, preemployment conditions (24.5%), family history of perceived illness (17.3%), and persistence of symptoms (16.3%) [Table 4]. Up to 31.5% of the respondents (N = 47) said that they often ignored going for medical checkup for a perceived illness, especially for ailments they regarded as common ailments (82.2%), for illnesses perceived to have no cure (8.9%), and for illnesses with social stigma (2.2%). Regarding self-medication, 75.2% of the respondents took drugs without doctor's prescription; such drugs included antimalarial drugs (57.0%), analgesics (55.0%), antibiotics (49.7%), cough mixtures (34.9%), and antacids (20.1%). Most of the respondents (75.2%) sought the attention of a doctor for an illness; however, about 19% of them have sought treatment with traditional medicine either because orthodox medicines had failed to cure them of their symptoms (22.2%) or because they felt the former was cheaper (3.7%). Traditional medications used were mainly herbs (80.0%), “rubutu;” a religious inscription written with local ink, which is usually washed and drank by Muslims (12.0%) or other forms of concoctions (8.0%) [Table 5]. 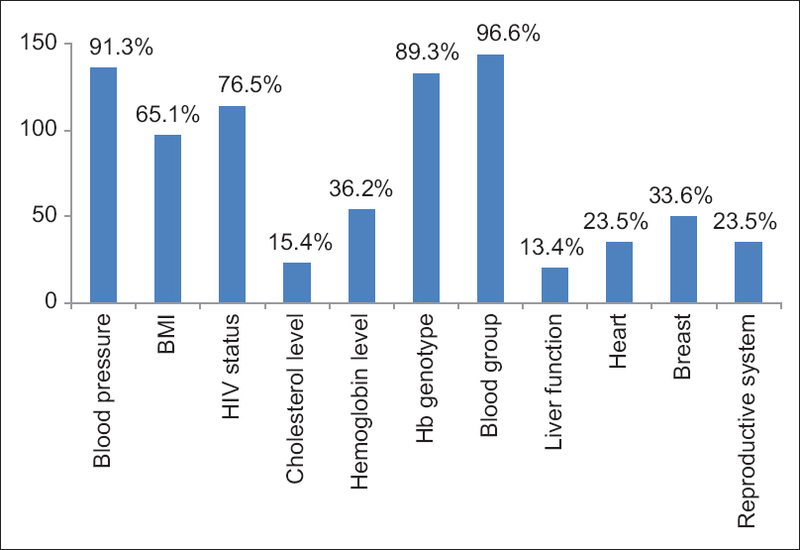 Respondents' knowledge about their health indices was good; 136 (91.3%) respondents knew their current blood pressure, 144 (96.6%) knew their blood group, 133 (89.3%) knew their hemoglobin genotype, and 114 (76.5%) knew their human immunodeficiency virus status [Figure 2]. Factors found to significantly influence health-seeking behavior for preventive care were marital status, advise by doctor to go for periodic medical checkups, and fear of the outcome of checkup (P = 0.027, P < 0.001, and P = 0.012, respectively). Other factors such as age, profession, family/previous history of a medical condition, and length of practice were not found to significantly influence their behavior toward preventive health practice. With respect to seeking treatment from a doctor, length of practice was found to be a significant determinant; those who have been in practice for up to 10 years or more usually sought treatment from a doctor (87.8%) as against those who have practiced for <10 years and this observation was statistically significant (P = 0.013). Other factors such as age and profession did not significantly influence respondents' health-seeking behavior for curative care [Table 6] and [Table 7]. In this study, a little over half of the respondents (53.7%) were within the 30–39 years' age group, a finding similar to what was observed in a study among nurses in the UK, but contrary to the findings of a research on health-seeking behavior of doctors in South Africa. This disparity is likely due to the heterogeneity of the study population in our study. Females were slightly less represented (45.6%) than males, agreeing with the findings of a study conducted in Hong Kong, China. In a study conducted by Branney and Newell, however, females were more represented than males. The higher representation of females in the latter study could be explained by the fact that the study was conducted among nurses, a profession that is largely dominated by females. It was found that those of younger age group sought periodic medical checkup and treatment (32.9%) more compared to the older age group (6.7%) and this agrees with similar findings among health professionals in Lagos University Teaching Hospital (LUTH) and in Hong Kong, China. Almost 99% of the respondents felt it was important to go for periodic medical checkups and their main reasons were to know their health status and to facilitate early diagnosis of the disease. Majority of the respondents believe that it was better to detect a disease prior to appearance of symptoms during routine medical checkups. Similar observations were made in LUTH and University of Ilorin Teaching Hospital (UITH), where majority of health professionals felt that periodic medical checkup was necessary. The practice of self-medication was rampant among the respondents even though majority of them felt it was not a good practice, a finding similar to studies conducted in Australia, Finland, and Ethiopia. This practice of self-treatment could be attributed to poor regulatory mechanism on the sales of drugs and the relative availability of most of these medicines as over-the-counter drugs. In addition, as health workers, another reason for this behavior could be respondents' knowledge of diseases/treatment as well as their ease of access to drugs. For most of the respondents who had gone for periodic medical checkup before, previous history of a perceived illness and the need to meet preemployment medical requirements were important contributors to a positive preventive care-seeking behavior while time constraints and the fear of outcome of evaluation were significant negative contributors. In South Africa, however, findings of a similar research among doctors were to the contrary and reasons cited for poor health-seeking behavior in the study were feeling of embarrassment on consulting another doctor, doubts about confidentiality of consultations, and social desirability factors of being seen as a weak doctor by patients. Though not of statistical significance, the practice of preventive health-seeking behavior was more among the doctors and nurses compared to MLS. Encouraging or requesting health workers to go for periodic medical checkup was found to significantly influence health workers' health-seeking behavior. Half of those who were advised to go for routine medical checkup in the past had done so, compared to those who were never advised to (P < 0.001). This finding is similar to that reported in University of Ilorin Teaching Hospital (UITH), where routine medical checkup was found to be higher among health workers who were encouraged to go for regular checkup. Contrary to expectations, medical checkup was found to be of higher frequency among those who were never exposed to situations warranting disease screening during practice (P = 0.001). The reason for this could be because those who had been exposed to one disease or the other might fear the possibility of testing positive to a test and as such may fail to go for checkup. Similar observation was made in a study conducted by Adamu et al., where some of the respondents said that the fear of detecting a lesion in their breast prevented them from performing breast self-examination. This further suggests gaps among various groups regarding the benefits of detecting disease conditions at their earliest stages. In this study, positive health-seeking behavior was found to be better among respondents with family history of medical conditions as compared to those without family history of any medical condition. The positive health-seeking behavior observed among those with a family history of medical conditions could be due to their perceived susceptibility to such diseases, especially diabetes and hypertension. In a study conducted by Lanre-Babalola, it was observed that those with family history of medical conditions were more likely to go for routine screening much earlier than those without any family history of medical conditions. According to the Health Belief Model, peoples' perception of susceptibility and severity of disease strongly determines their health-seeking behavior. There is a good perception of the importance of periodic medical checkup across the professions; however, varied pattern of periodic medical checkup was observed. The practice of self-medication was found to be high among the health workers. Age, gender, profession, and number of years in practice were among the factors influencing health-seeking behavior. Hospital authorities should make it mandatory for all health workers to undergo a preemployment medical checkup and the health workers should be encouraged and supported to do periodic medical checkup at regular intervals. We wish to acknowledge that this research was fully funded by the authors presented herein. MacKian S. A review of health-seeking behavior: Problems and prospects. Health Systems Development Programme, University of Manchester, Manchester; 2003. Available from: http://www.r4d.dfid.gov.uk. [Last accessed on 2015 May 15]. David VM. Illness and sick-role behavior. Encyclopedia of Public Health. The Gale Group Inc; 2002. Available from: http://www.encyclopedia.com/doc/1G2-3404000445.html. [Last accessed on 2016 Jul 13]. Afolabi MO, Daropale VO, Irinoye AI, Adegoke AA. Health-seeking behavior and student perception of health care services in a university community in Nigeria. Health 2013;5:817-24. Ahmed S, Sobhan F, Islam A, Barkat-e-Khuda. Neonatal morbidity and care-seeking behaviour in rural Bangladesh. J Trop Pediatr 2001;47:98-105. Clarke J, O'Sullivan Y, Maguire N. A study of self-care among Irish doctors. Ir Med J 1998;91:175-6. Osmond H, Siegler M. Doctors as patients. Practitioner 1977;218:834-9. Branney J, Newell D. Back pain and associated healthcare seeking behavior in nurses. Clin Chiropr 2009;12:130-43. Gonçalves-Silva AC, Murta-Nascimento C, Eluf-Neto J. Assessing screening practices among health care workers at a tertiary-care hospital in Sao Paulo, Brazil. Clinics (Sao Paulo) 2010;65:151-5. Furman S. A study of doctors health seeking behavior. Afr Fam Pract 1992;13:92-7. Akande TM, Salaudeen AG. Practice of periodic medical examination among hospital workers in a Nigerian teaching hospital. Niger Q J Hosp Med 2014;14:206-10. Frank E, Brogan DJ, Mokdad AH, Simoes EJ, Kahn HS, Greenberg RS, et al. Health-related behaviors of women physicians vs. other women in the United States. Arch Intern Med 1998;158:342-8. Lweis M. Self Medication or Self Destruction? Available from: https://www.psychologytoday.com/blog/addicted-brains/201208/self-medication-or-self-destruction. [Last accessed on 2015 Jun 12]. Available from: http://www.uduth.org.Office/of/the/CMAC/UDUTH. [Last accessed on 2015 Apr 12]. Ibrahim T. Sample size determination. In: Research Methodology & Dissertation Writing for Health & Allied Health Professionals. 1st ed. Abuja: Crest Global Link Limited; 2009. p. 70-5. Eke CO, Eke NO, Joe-Ikechebelu NN, Okoye SC. Perception and practice of periodic medical checkup by traders in South East Nigeria. Afrimedic Journal 2012;3:28. Chen JY, Tse EY, Lam TP, Li DK, Chao DV, Kwan CW, et al. Doctors' personal health care choices: A cross-sectional survey in a mixed public/private setting. BMC Public Health 2008;8:183. Lanre-Babalola FO. Routine medical checkups and preventive health knowledge among health professionals in LUTH, Idi Araba, Lagos state. Glob J Appl Manag Soc Sci GOJAMSS 2014;7:82-8. Pullen D, Lonie CE, Lyle DM, Cam DE, Doughty MV. Medical care of doctors. Med J Aust 1995;162:481, 484. Töyry S, Räsänen K, Kujala S, Aärimaa M, Juntunen J, Kalimo R, et al. 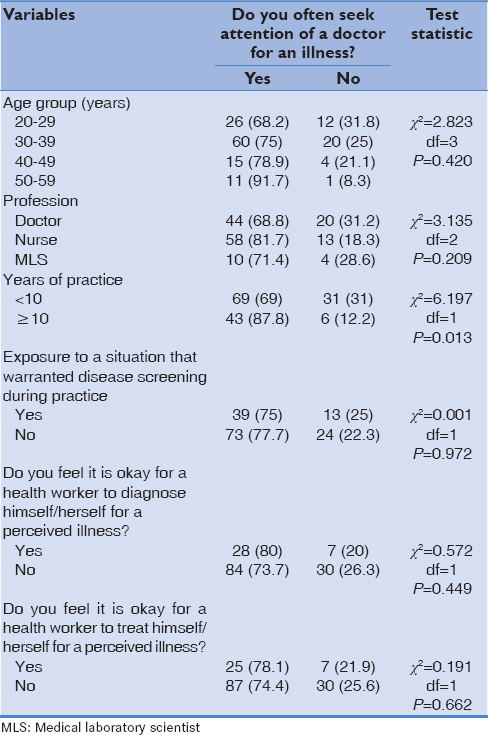 Self-reported health, illness, and self-care among Finnish physicians: A national survey. Arch Fam Med 2000;9:1079-85. Begashaw B, Tesfaye T. Healthcare utilization among urban and rural households in Esera district: Comparative cross-sectional study. Am J Public Health Res 2016;4:56-61. Adamu H, Shuaibu K, Adamu AN. Knowledge, Attitude and Practice of Breast Self Examination among Female Students of a Tertiary Institution in Sokoto, North-West Nigeria. Ann. Int. Med. Den. Res. 2016; 2:74-9. Rimer B, Glanz K. Theory at a glance. A guide for health promotion practice, 2nd ed. Bethesda, Maryland, US Department of Health and Human Services, 2005. Available form: http://www.cancer.gov/cancertopics/cancerlibrary/theory.pdf. [Last accessed on 2011 Mar 30].